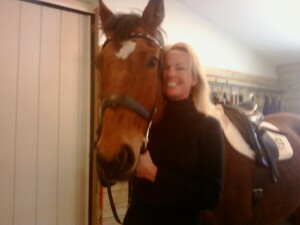 Is a lifelong, multi-disciplined equestrian with an emphasis on fun and specializing in the Musical Freestyle. Debby is a Radio/TV Talent who enjoys sponsoring and designing products for the hard working as well as the elite equestrian. Since earning her Ten-Year 4-H Pin she has dotted her riding trail by backing and training her own horses realizing a groundswell of Championships. In recent years Debby spearheaded, “The Golf-Rider Challenge”, which is an annual event corresponding with The Great Lakes Equestrian Festival held at The Grand Traverse Resort Village. The Fun Freestyle debuted with the infamous “Itsy Bitsy Teeny Weeny Yellow Polka Dot Bikini” ride and was immortalized on video and in several magazines. Dressage Today, Hunter & Sport Horse, USDF, Sidelines are counted among her published works.